Puri is one of the four most famous holiest cities of Hindus in India. The beach town of Puri is situated about 55 kms. from Bhubaneshwar. According to legends, Puri was once a thickly wooded hill inhabited by the Sabaras (Pre-Aryan and Pre-Dravidian tribes of the Austric linguistic family). Puri is the abode of Lord Jagannath and known for its famous Jagannath Temple and Puri beach. The Jagannath temple is also known for its famous Rath Yatra or Car Festival which attract thousands of pilgrims. The sense of devotion heightens in Puri with nearly every aspect of the place touched by the aura of the magnificent temple. Puri can be visited round the year, but the best season to visit Puri is from November to March. The main tourist attraction in Puri is the Lord Jagannath Temple and Puri beach. Some other important temples in Puri are Gundicha, Lokanath, Sunaragauranga, Daria Mahabir and Tota Gopinatt. There are also various monasteries locally known as mathas in Puri. 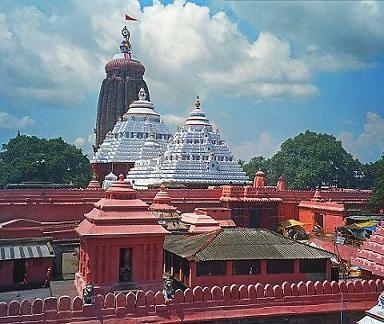 The Jagannath Temple was built during the 12th century A.D. by Chodaganga Deva. This temple dominates the landscape for kilometers around in Puri. This temple is tallest temple in Orissa which rises to 65 meters high. This temple is also one of the most magnificent pieces of monuments of India. The main deity of the temple is the Lord Jagannath or Lord Krishna which is the main focus of the religious life in Orissa. The other two deities in this temple are Balbhadra and Subhadra. This temple was used by the European sailors as a navigation point and called as white pagoda. It was known so as the walls of the temple were plastered by the king to protect it from the salty sea. In front of the main gate stands a 16 sided monolithic pillar (11 metres high), called Aruna Stambha which formally stood in front of the Sun Temple and was brought to Puri during the 18th century A.D. Due to its great religious importance and hallowed traditions, non-Hindus are not allowed within the temple complex, but, they can see the temple from a specified point. The performance of the various rituals have made every citizen of Puri a part of the temple in his own way. 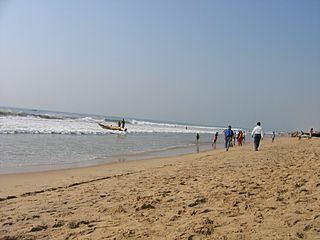 The Puri Beach is another famous tourist attraction in Puri. The Puri beach is one of the finest beach in the world and watching the sunrise and sunset in a symphony of colours is a wonderful experience. The Puri beach is also one of the most popular sea-side resort which is visited by the tourists from all parts of the world. The other attraction of the beach are the excellent surf and shallow waters. The water is shallow enough to walk at a very long distance. The currents are strong some times, but one can also swim by taking care. You can also enjoy boating in the sea. hawks and various other birds migrate here during the winter from Persia and Siberia. One can also enjoy the wondrous sight while boating down the gentle waters or fishing for the abundant fish. The Balighai beach is a famous picnic spot situated about 8 kms. from Puri. The Sun and fun at the mouth of the Nuanai river is unforgettable. Brahmagiri is known for the living shrine of Alarnath. Various pilgrims visit Alarnath during Anabasara of Lord Jagannath. Satyabadi or Sakshigopal temple is situated only 20 km away from the main road leading to Puri. The main deity in this temple is the Sashigopal or Child Krishna. According to the legend, the Child Krishna was called here as a witness in the dispute between the two Brahmins and then remained here beecause of its attraction. It is believed that the visit to Puri is incomplete without a visit to Sakshigopal. The shrine of Baliharachandi is situated on the solitary sand dunes, about 27 km to the south-west of Puri. This temple is situated on a sandy hill near the sea and adjacent to the mouth of the river Bhargavi. The goddess Durga is worshipped here as Baliharachandi. The scenic beauty of this place is ideal for group picnic. Raghurajpur is one of the most famous artist village in Orissa, situated about 16 kms. from Puri. The village of Raghurajpur boasts not only of the exquisite Pattachitra and Talapattachitra, but is also the native place of Guru Kelucharan Mahapatra, the famous Odissi dancer. Even today, under the tutelage of renowned Guru, young boys can be seen practicing the Gotipua dance here. Satapara is located near the confluence of the Lake with the Bay of Bengal, about 52 kms. from Puri. This is an ideal place to enjoy Chilka lake and retreat in nature. Dolphins, migratory and resident birds can be seen in this place. Soap Stone, Sea-shell, Pattachitras, Palm Leaf paintings, Horn work, Wood carvings, wooden images of the deities, art and craft works and Solapith work can be purchased from Puri. Various colourful festivals are celebrated in Puri round the year. The Ratha Yatra or Car Festival, Puri Beach Festival, Ganesh Puja, and Jhulana Jatra are some of the famous festivals celebrated in Puri. The Rath Yatra is a famous festival of Puri in which pilgrims from India and all parts of world visit Puri. In this Rath Yatra, the images of Jagannath, Balabhadra and Subhadra, are taken in three gigantic chariots in a procession to their summer temple for a week. These chariots are drwan by devotees from all over India, accompanied by the devotional music. Before this, the three deities are given a ritual boat ride after being bathed in fragrant sandalwood-scented water. The deities then retire to their garden home. New attires are worn by them everyday, and after eight days, they return to the main temple in their magnificent chariots drawn by devotees. The nearest aiport is located at Bhubaneshwar, about 62 kms from Puri. Puri can be easily approached with rail. Puri is a railway terminus with rail connections for Bhubaneshwar. Puri is connected with Bhubaneshwar and Konark by very good roads.